Elvis Presley was wholly unique. He was always on the cutting edge of fashion, music, art, décor, and technology. Car phone(s) installed in his cars including limos. This was extremely rare even for the richest of Americans at the time. First remote control TV then called a “clicker”. Elvis owned the largest TV screens along with the state of the art audio systems for his cars and homes. First VCR that Sony ever offered in the United States. There are stories that Elvis was offered the first unit and he soon mastered it and it became one of his favorite entertainment devices. Wide screen projector located in the Jungle Room at Graceland. 3 TVs on wall aligned on a wall where he would watch all 3 football games at the same time. This room was located at Graceland and the genesis was the same type of setup as did the (then current) President of the United States. Elvis loved music and had, among other things, record players – juke boxes – stereo systems – and had several portable transistor radios with earbuds. He owned one of the first digital watches though he preferred the classic watches of quality and owned many. Instant photographs. Elvis bought, and took, hundreds if not thousands of Polaroid pictures and owned numerous cameras. Home movies. Elvis owned many top of the line video cameras and used them to capture everything from birthdays to his engagement to Priscilla to horseback riding to special moments with Lisa Marie. Elvis owned one of the first residential closed circuit camera security system at Graceland where he could access it from his bedroom and in the kitchen area. 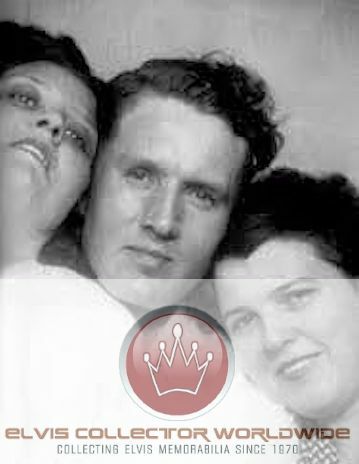 Gladys Love (Smith) Presley was the beloved mother of Elvis Presley. On this, the 66th anniversary of her (sadly) death, I was thinking of her – her mark on this earth – her caring – her worrying – her grace – and all that she endured (being poor and then wealthy beyond comprehension) throughout her (when she died on August 14, 1958) 46 years on this earth. To learn more about Gladys Presley I highly recommend the incredible series of books, about Elvis and those he loved and befriended, authored by Alanna Nash. Her books can be found, among other outlets, on Amazon as well as app stores. 1955 – Elvis worked on the Louisiana Hayride in Shreveport, Louisiana. 1956 – Elvis was scheduled to appear, on December 3, between 3:30-4:30 p.m. on Dewey Phillips’ Pop Shop which was Dewey Phillips’ new TV show in Memphis. Dewey Phillips was the first DJ to play an Elvis Presley record at the bequest of Sam Phillips of Sun Records. 1957 – Elvis spent New Year’s at Graceland dealing with the reality that he was being drafted into the US Army having received his draft notice just 11 days earlier. 1958 – Elvis was living at the Hotel Grunewald in Bad Nauheim. 1959 – It is believed that Elvis spent New Year’s Eve with Priscilla whom he had first met the previous September. 1960 – Elvis was in Hollywood filming Wild in the Country. Elvis flew home to Memphis a week before to be come for the holidays. He returned to Hollywood on January 2nd to resume filming. 1961 – Elvis was in Hollywood completing work on Kid Galahad as of December 20th. For some reason Elvis opted to spend the holidays in Las Vegas. 1962 – Elvis began having New Year’s Eve Parties which would continue throughout the 1960’s. While at Graceland Elvis, and friends, lit off fireworks and then Elvis hosted a party at Memphis’s “Manhattan Club” for over 200 lucky family, friends, and fans. 1963 – Elvis watched movies, with Priscilla who now was living full time in Memphis, at the Memphian Theater (which Elvis had rented out for the evening). 1964 – Elvis hosted a party at the Manhattan Club in Memphis. 1965 – Elvis hosted a party at the Manhattan Club in Memphis. 1966 – Elvis hosted a party at the Manhattan Club in Memphis. 1967 – Elvis hosted a party at the Thunderbird Lounge in Memphis. 1968 – Elvis hosted a party at the Thunderbird Lounge in Memphis. 1969 – Elvis hosted a party at TJ’s club in Memphis. 1970 – Elvis was in Washington DC getting a special tour of FBI headquarters and then flew home to host a party at TJ’s club in Memphis. 1971 – Elvis held a private party at Graceland. 1972 – Elvis relationship with Priscilla was failing and he was losing weight, and rehearsing, for his infamous 1973 Aloha from Hawaii concert/television broadcast. 1973 – Elvis spent a quiet time at Graceland. 1974 – Elvis was at Graceland dealing with health issues. 1975 – Elvis appeared at the Silverdome in Pontiac, Michigan before an estimated crowd of 60,000. 1976 – This would (sadly) be Elvis’ last New Year’s Eve and he spent it onstage at the Civic Center Arena in Pittsburgh before an estimated crowd of 16,049. At midnight Elvis sang “Auld Lang Syne’.